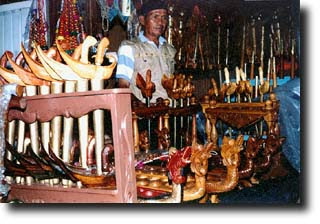 The most famous pusaka or heirloom for Javanese people is Keris (dagger). In the ancient time, a man is not considered as a real man if he has no keris. The keris is highly valued, treated and respected with special care. This pusaka is usually inherited from fore fathers. According to Javanese ancient tradition, especially in the court families, a father was obliged to give to his adult son at least a keris.. In general, keris is divided to two important parts, the blade (Wilah) and the scabbard (Warangka), to protect the blade. The process of the making of the blade in the old days may last one year only for one keris. The keris maker is called an Empu. Only the respectable Empus could make a high quality keris, physically and spiritually. Empu has to do some spiritual deeds to prepare a keris, like fasting, not sleeping for several days and nights, meditation, etc. In Principle, a keris is a personal sacred weapon, it is made by an Empu, in accordance with the wish of the consumer. The manufacturing of keris is complicated, for short as the following : At workshop with good fire plate to case the row materials such as 5 kg iron plate, measuring; 4 cm wide, 2 cm thick, 15 cm long; 50 gr of nickel and 0,5 kg of steel. The iron is heated until it become smaller, it forges again and again. The 5 kg iron become 2 kg forged iron. The nickel inserted in between the forged iron, smolder them, forged them carefully to produce the desired 'pamor' or surface pattern. Afterward the steel sheet, together with above forged iron and nickel, smolder and forge again. In this stage the keris should be made Keris Lurus (a straight keris) or Keris Luk (keris with curves). The keris should be formed in accordance to the blue print, using several tools such as; rough fine, triangular files, grindstone and chisels. Afterwards the keris should be heated but not smoldered and than plated, to make the keris more durable. After it has been plated, it should be soaked in a mix solution of sulfur, lemon juice and salt. The keris is ready and its weight is about 0,4 kg. Despite its physical characteristic, keris contain a spiritual mission. The original spiritual power is the wishes of the Empu, the maker. While preparing and making a keris, the Empu, in the holy state, solemnly pray to God Almighty, the keris should contain spiritual wishes as requested by the Empu or the consumer. It depends who is going to use the keris, the mission should be different, for instance, for the kings, begawans (priest), generals, high ranking officials, farmers, traders, fishermen, workers, soldiers, etc. So, it could be easy to understand that a keris which good for king , may be not good for a trader. The Additional and/or Other Spiritual Power of Keris. The keris could be filled with spiritual beings, unseen by ordinary people, such as a genie, (jin or qodam) in order to protect or to help the keris owner. 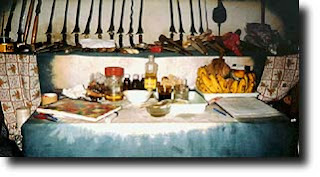 The Physical characteristic of Keris, also symbolizing its mission. Dapur : Jalak Ngucup Madu (jalak is a starling, a kind of bird; ngucup is drink; madu is honey). The wish is clear, the owner of the keris should live in prosperity. Pamor : Udan Mas (udan is rain; mas is gold). The keris has a mission to help its owner to have an abundant wealth. Luk 3 : symbolizing a success to achieve some wishes. Luk 5 : to be loved by other people Luk 7 : dignity. Luk 9 : dignity, charismatic and leadership. Luk 11 : to achieve high position Luk 13 : peaceful and stability of live. A keris is considered 'good' if it has perfect physical characteristics and at the same time contains good and strong spiritual power. Menayuh KerisAs it has been explained above, that keris is originally a very personal heirloom, fit only for the owner. Nowadays, there are a lot of keris in the market for sale, the term used is not buying and selling, but Mas Kawin (Bride price). How could someone know that a keris should be fit for buyer ? The keris should be tayuh (asked), what is its missions, who is the Empu, etc, of course by an expert in this field who has ability to communicate with a keris. The price in terms of money are very variable, depends to its quality. 'Ordinary' keris should be around Rp. 250.000,- (US$ 100), but a masterpiece could reach as high as US$ 50.000 !! !